Surgical reconstruction and rehabilitation improves the individual´s ability to perform many of her/his prioritized goals. The greatest improvements are observed not only in the basic activity like “eating” but in activities generally regarded as complex and not measured in standard Activity-of-Daily Life measurements e.g. “doing housework” and “leisure”. Also, it is important to remember that improvement continues during first year after surgery. A critical function for controlling the hand is elbow extensor (Triceps). Ability to stretch elbow is important for reaching out the hand and reach overhead objects. 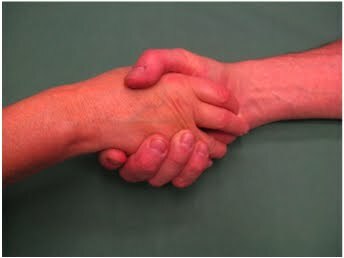 The combination of triceps function, opening of the hand and grasping is a substantial improvement of hand control and ability. Another important skill linked to triceps function is maneuvering a wheelchair. The footage below demonstrates the function of triceps 6 months after surgical reconstruction and the improved wheelchair push from reconstructed triceps one year after reconstruction. This movie shows the elbow extension 6 months after a tendon transfer to replace loss of triceps function. Compare the right reconstructed side with the left and yet non-reconstructed side. This movie demonstrates the improved power of pushing the driving wheel och the wheelchair after reconstruction of triceps but before grip reconstruction. Recent studies in our unit have demonstrated that the combination of triceps and grip reconstruction increased the tetraplegic person's ability to maneuver a manual wheelchair. For example, performance of sprint, uphill driving and static push improved by more than 60 percent after surgery. This may be the change that makes a person willing to drive the wheelchair outdoors or even swap from electric to manual wheelchair for good. 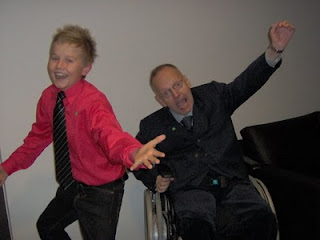 Picture above demonstrates a birthday party where a man who less than half a year ago underwent reconstruction of triceps and grip function dances with his grandson.